Manufacturer & Supplier of UPVC Roofing Sheets & UPVC Multilayer Roofing Sheets. Our product range also comprises of Polycarbonate Sheets, Buildex Self Drilling Screws and Roofing Sheets. 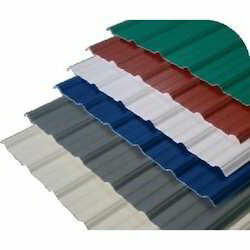 UPVC Multilayer Roofing Sheets is a modern rigid three layer Unplasticized poly vinyl chloride (uPVC) roofing sheets. The advanced technology of manufacturing ensures superior quality and performance of the roofing product. This uPVC is the best replacement for conventional asbestos, metal G.I. sheets, fiberglass sheets, ceramic tile sheets and uPVC sheets considering the heat insulation, sound insulation, water resistance, chemical and alkali resistance, corrosion proof, fire retardant, eco-friendly, easy to install and move, light weight as well as cost effective in installation and it can save construction cost up to 70%. As per the efficiency and benefits it provides.These sheets have attractive design and appearance, possess wide range of advantageous properties and have an affordable price.